Social Media Compliance | GRC Module | Brandle Inc. The Brandle GRC module delivers the tools you need to achieve social media compliance to your corporate brand standards and to industry regulations. Every marketer knows that a consistent brand image and active social media program is the strongest presentation of your brand. But delivering a consistent brand image across all company social media accounts can be difficult for the central governance team to achieve. And ensuring corporate policies are met, such as meeting a required posting schedule, is almost impossible with a globally distributed brand presence. 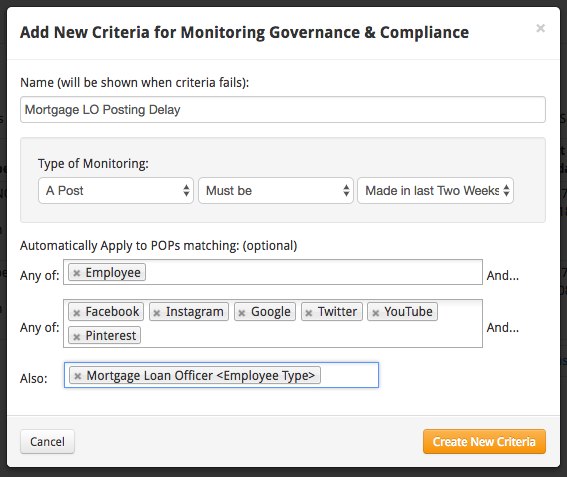 The Brandle GRC module makes monitoring a large social portfolio manageable! If you are in a regulated industry (such as financial, healthcare, and pharmaceutical industries), having social accounts out of compliance is a significant corporate risk! 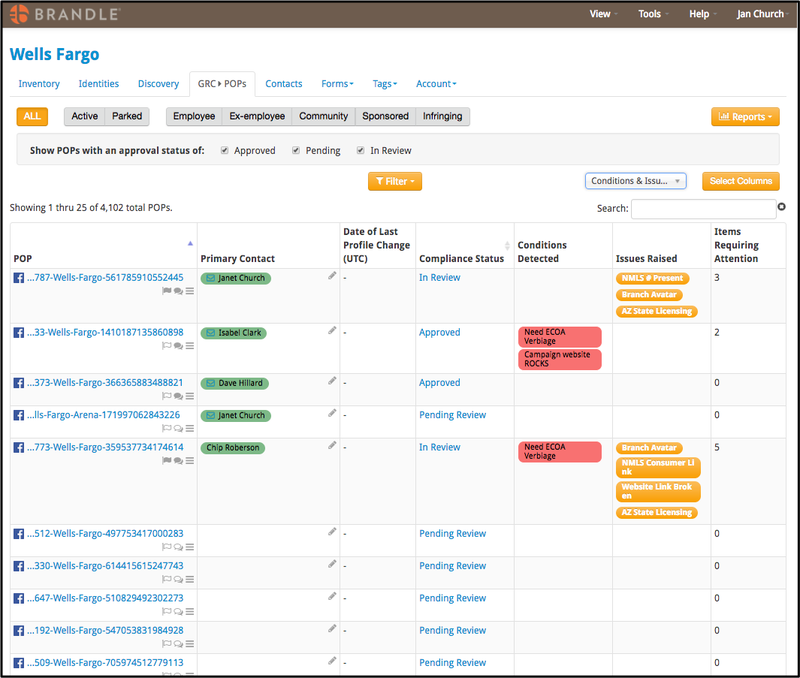 The Brandle GRC Module makes it easy to review, request changes to, approve, and report on the compliance process of all the POPs relating to your brand(s). All communication is recorded and time stamped for a clear audit trail. Pull Compliance Reports by territory, or special tag, and deliver clear data to management or auditors. Let Brandle do the monitoring work for you! Set-up Criteria to direct Brandle to search your Social Accounts automatically! Set-up Criteria language that either must be included or excluded from a POP, look at the last time the account owner posted, or search for a specific URL that should be included. Apply the Criteria to selected categories in your Inventory, selected social networks, and even selected Tags. Receive alerts when a Criteria is not met and view them in your GRC Table. Criteria can also be applied to search for items within your Brandle Inventory. 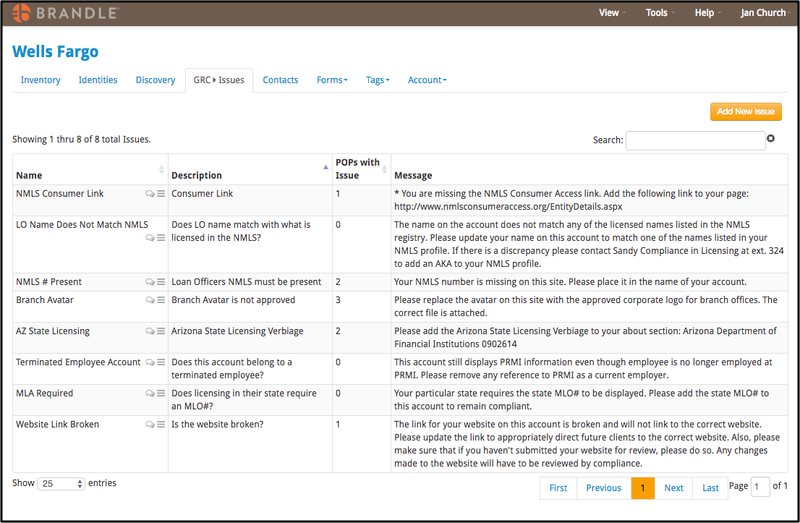 GRC Issues allows you to set-up the communications issues you will need to highlight with POP owners. This saves you time in processing compliance with large groups of people, such as corporate employees or partner programs. Set-up Issues that are important to your business, such as requiring a consumer complaints link or a license number. Communicate Issues and concerns directly with a POP owner and have all communication recorded on a POP Note with date stamps. No need to have a POP owner become a User in Brandle! Simply enter the email address of the owner and start communicating about compliance! View your Inventory by POP View. See which POPs are 100% approved as Compliant, In Review, or Pending Review. Quickly determine which POPs have Criteria alarms and outstanding Issues. When a Criteria alarm goes off, or when you apply an Issue, Brandle automatically resets a previously Approved POP to In Review. Brandle is designed to help you ensure ongoing compliance! 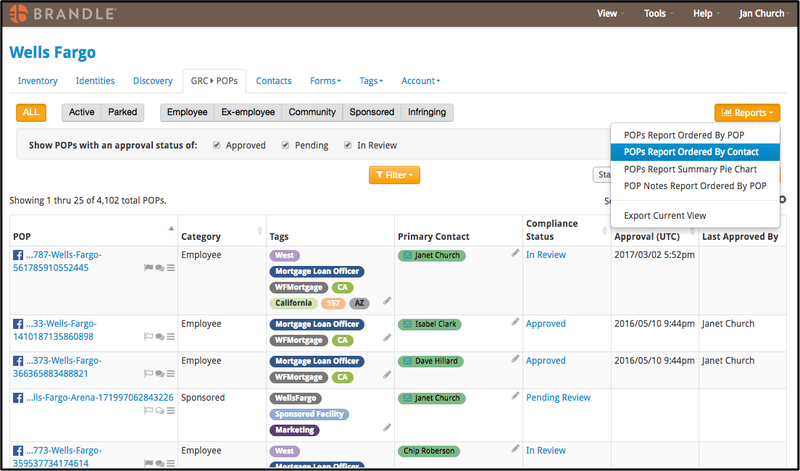 Review Compliance by person with the Contact View tab. Brandle provides Compliance Reports ordered by POP or by Contact. Reports can be filtered by Tag to focus report efforts on Region, Business Unit, or any other Tag.